This colorful image was also used by the Adventist Church's @gcsession Twitter handle at GC San Antonio. Mad props. SILVER SPRING, Md. --- As vigils for the Orlando shooting victims are held across the United States and the world, individuals and organizations are finding unique ways to support the victims' loved ones. Free flights, free accommodation and, in the case of even some Adventist churches, free funerals are on offer. 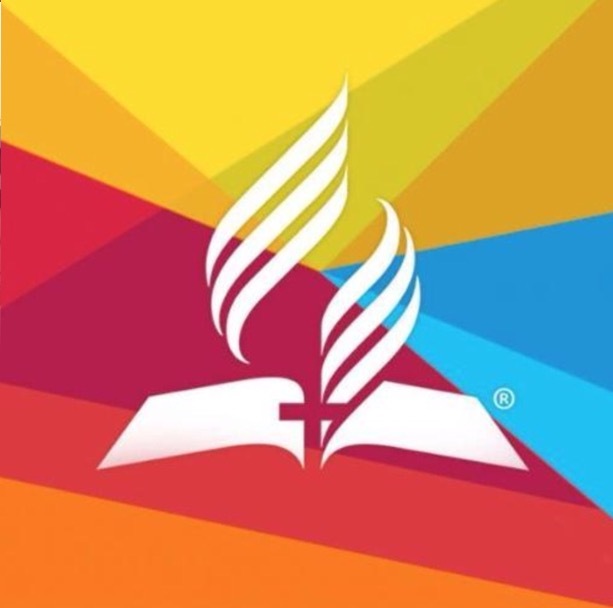 Although no vigil for the tragedy has yet been held at the General Conference of Seventh-day Adventists, leadership joined in the show of love and support for the victims by digging up the most "rainbowed-up version" of the denomination's branding artwork and making it the church's official logo. "Listen, nobody is saying we agree with certain aspects of the gay lifestyle, but God made rainbows and there is absolutely no reason we can't show some love with an old image that we already had on file," said GC Communications spokesperson Hazlo Porfa. "We already used the 'Rainbow Brite' version of our logo on Twitter last summer at the GC. No harm resurrecting it." You are working extra hard this week on pushing the gay agenda. Because I was not gay. IF THIS WERE TRUE THEN IT WOULD BE TIME TO QUIT THE SDA CLUB. BEING A MEMBER OF THE SDA CHURCH IS NICE BUT NOT ESSENTIAL. I do not regard this as pushing the gay agenda! However, IF this was an attempt at satire (which I greatly enjoy in most of the B.A. Posts), I think it was probably in poor taste in light of the tragedy just experienced. What I have seen posted revolving the Forrest Lake SDA Church response, with offers of funeral assistance etc., most accurately reflects the WWJD attitude often conspicuously missing at the higher levels of our church. Forrest Lake – your light shines far! Too bad no SDA pastor has enough faith to raise any of the dead or heal the sick, with the power of the holy spirit of course. Congratulations to Forest Lake for their concrete ACTS of love. The GC superficial and guarded response is insulting. Better to say nothing. It is its condemnation of gays that supports anti-gay behavior. Has the GC opposed the draconian laws in Africa that have been initiated and supported by Republicans? By the way, I’m straight but a loving Secular Humanist. Let the church condemn others while they thank God they are not like those they condemn. The Gay Agenda is simply to get equality, to remove all vestiges of discrimination against LGBT people due to the sexual orientation they were born with. If God made everything, then God made lesbians, bis, gays, and transexuals too. If he didn’t, then God didn’t create everything. And if God didn’t want LGBTs all he would have to do is a little discrete genetic tinkering and there wouldn’t be any, a small and invisible miracle, no sweat. If God is the source of everything, the Creator of everything, and God is in control, if God is almighty, infinite in power, omnipotent, then as a matter of logical necessity the world and everything in it is exactly as God wishes, because if God wanted it to be otherwise, it would be. Following this logic, that means God also wants babies to be born with horrific deformities or brain damage or with both male and female parts…or any other medical problem in existence. I’m an Adventist myself, and I think that while God certainly loves every human being unconditionally, regardless of their status or sexual orientation, that doesn’t necessarily mean that he “wants” them to be born with these things or to have to live with these things. There are many things that are a result of sin in the world. It’s not a sin to be a homosexual. That’s just a matter of genetics. The sin is in the lifestyle. Yes, God loves and wants everyone – but I don’t think he intended for things to be the way they are now. And if he were to snap his fingers and magically make it all disappear, how just a God would he be? Then most people would probably feel obligated to serve him out of fear, while others would hate him even more than they already do. For now, love and compassion is what’s needed. I totally agree with that. And I have no doubt whatsoever that many, many gay people will be in Heaven. I do have to say that while I enjoy reading the satirical posts by Barely Adventist, I’m a little disappointed that they chose to make jokes about this particular event. It really does seem in poor taste. This story is calling for discussion of the church’s response to the situation; it is not making jokes about the situation. Some people are so used to seeing humor on this site, that they did not pick up on the distinction between humor and satire. There is a difference. Hey Ray, they are waiting for you at the parade. Steer or queer? How does the “rainbowed-up version” show support of the Orlando shootings when we as a church are just showing our concern for such a merciless act. We are very much a part of this world and feel hurt when others are hurt in any way what so ever. Can’t we express our condolences for others who suffer as civil human beings. Whether its a “rainbowed-up version” or directly a picture of a rainbow it in no way down plays our feelings of the gay lifestyle or neither does it change our view of the way they live. Frank. I’m confused by your statement. It’s not clearly expressed. If you are saying it’s perfectly legitimate to offer condolences for the suffering created by a homophobic, mixed up man, but agree with his condemnation of the gay lifestyle, you are supporting violence against the LGBTQ community by those who are not as nuanced as you appear to be. Rejection is a form of hate, no matter how conflicted one is about negative consequences that follow. Who are you to judge? I thought that was God’s prerogative. We have a right to have biases, prejudices, evil thoughts and to hate and judge, in fact most of do. Its called freedom. But there is often a price. I find it disturbing that most Evangelical Churches, Adventists included, seemed to have narrowed the 10 commandments down to two, while overlooking all the other transgressions that we all are guilty of at one time or another. I am talking about Abortion and Homosexuality. Ironically, neither one of these came up in the narrative of the Gospels. Jesus never said a word about them. Am I missing something or are we just dangerously close to being like that Baptist pastor in Sacramento? First of all, Jesus wrapped up the 10 commandments into two. The first 4 being Love the Lord thy God with all thy heart and the last 6 being love thy neighbor as they self. Abortion is wrong, and I can’t see Jesus aborting a baby, because it was deformed or it was “unwanted”. That is murder. Secondly, God put up a system from the very beginning, stating that a man shall leave his father and mother and cleave unto his wife. Keeping this in mind, it would be coveting for a man to lust after a man, for that man is to go for a wife. Jesus, wants us to love the sinner, but not to condone sin. He rebuked the pharisees, and he also talked of “as in the days of Lot” and we are definitely here. Your wrong on both counts. A person becomes a living soul when it takes it’s first breath. There are several text to prove that, not that intend to. Second. Your comment about Jesus talking about marriage between a man and women has nothing to do with homosexuality. It only has to do with marriage. And after all, marriage is simply making a commitment to another person. Just go on judging people and I will try to keep loving them. Wrong Lindy, the child in the womb has a beating heart, breathing air is not the requisite, otherwise fish that swim are dead? While I love your satire pieces this is in poor taste. You’re making jokes of this horrendous tragedy and the blood hasn’t yet dried. People are grieving, show some sense and compassion. With respect, you might want to consider taking this post down until a much later date. With respect Aussie, not one joke has been directed at the Orlando victims. But we do need to find ways to improve as a church in how we love those around us. This blog is about addressing the big issues we face as a church and doing so in a voice that cuts through the noise and stands out. That cannot wait for a much later date. Thank you for clarifying the intention of this post. On re-reading it, in context of what you’ve said here, I can see what your heartfelt and well-meaning intent was. Thank you also to those who’ve pointed out that I had missed the satire. Sometimes it is difficult to distinguish between sincerity and sarcasm. I thought it was clear that this story is calling for discussion of the church’s response to the situation, rather than poking fun at the situation. Some people are so used to seeing humor on this site, that they did not pick up on the distinction between humor and satire. There is a difference. Thanks Sevvy for well saying what Darryl well said. I believe Donald Trump’s heated anti-Muslim rhetoric could be partly responsible for the massacre. The gunman said he had suffered discrimination and harassment based on his religion. I know several devout Muslims, and they are kind, respectful, delightful people. Trump is making things worse by painting them all as terrorists. Wrong. Trump is right. Stop legal immigration from Muslim countries. I dont want any in my house either. If that’s what most Americans say, How disgusting. What an inspiring video! We need more churches like that. Thanks for sharing. Well, the SDA Church probably did not offer a great response in general, but it was a million times better than this Baptist pastor in Sacramento. Anything sounds good in comparison to him. Chik Fil A did well. Best Chicken sandwich out there. They seem blessed too. How could you write this, even in jest.? God loves EVERYONE regardless. Not all people know your column is satire. You should take this one down. We could not agree more that God loves EVERYONE. And that’s a big reason we use satire, to get that message out there. BTW, satire was used by the prophets, Jesus and a number of more recent Christian authors. They used it because it resonates. But if you aren’t comfortable with it we get it and have more straightforward blogs/sites to recommend. We admire your passion. He might love everyone, but many are gonna burn in the end. It is my understanding that a number of SDA churches & institutions in the Orlando area are offering their facilities to any of the victims’ families. SDA’s from around the country are reaching out during this tragedy. “My house is a house of prayer for ALL people”, said the Messiah a long time ago. What is all the talk about gay people and Muslims? The NAD statement didn’t mention either. The folk at NAD are against hate! I suppose they also like kittens. I like kitten, too. I’m not as mean as people say I am. Even Donald Tramp likes me, and I like him. So there.